With Azure Logic Apps and Visual Studio, you can create workflows for automating tasks and processes that integrate apps, data, systems, and services across enterprises and organizations. This quickstart shows how you can design and build these workflows by creating logic apps in Visual Studio and deploying those apps to Azure in the cloud. Although you can perform these tasks in the Azure portal, Visual Studio lets you add your logic apps to source control, publish different versions, and create Azure Resource Manager templates for different deployment environments. 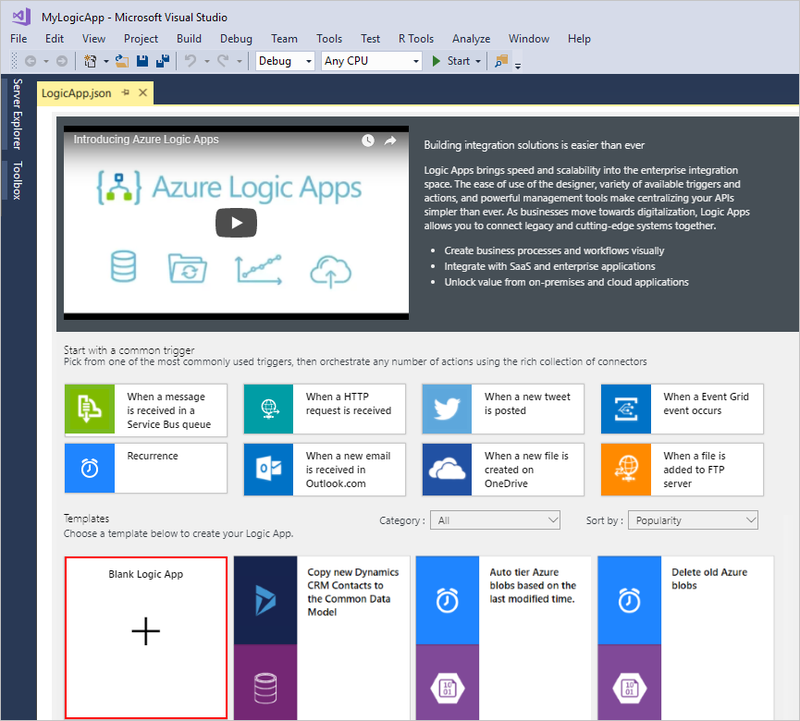 If you're new to Azure Logic Apps and just want the basic concepts, try the quickstart for creating a logic app in the Azure portal instead. The Logic App Designer in both the Azure portal and Visual Studio work similarly. If you don't have an Azure subscription, sign up for a free Azure account. Visual Studio 2019, 2017, or 2015 - Community edition or greater. This quickstart uses Visual Studio Community 2017, which is free. When you install Visual Studio 2019 or 2017, make sure that you select the Azure development workload. For Visual Studio 2019, Cloud Explorer can open the Logic App Designer in the Azure portal, but can't yet open the embedded Logic App Designer. Microsoft Azure SDK for .NET (2.9.1 or later). Learn more about Azure SDK for .NET. You can either download and install Azure Logic Apps Tools directly from the Visual Studio Marketplace, or learn how to install this extension from inside Visual Studio. Make sure that you restart Visual Studio after you finish installing. The designer requires an internet connection to create resources in Azure and to read the properties and data from connectors in your logic app. For example, if you use the Dynamics CRM Online connector, the designer checks your CRM instance for available default and custom properties. An email account that's supported by Logic Apps, such as Office 365 Outlook, Outlook.com, or Gmail. For other providers, review the connectors list here. This logic app uses Office 365 Outlook. If you use a different provider, the overall steps are the same, but your UI might slightly differ. 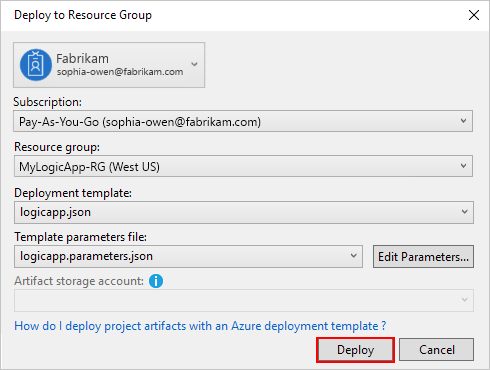 To get started, create an Azure Resource Group project. Learn more about Azure resource groups and resources. Start Visual Studio, and sign in with your Azure account. If the Cloud category or Azure Resource Group project doesn't exist, make sure you installed the Azure SDK for Visual Studio. In the Create a new project box, select the Azure Resource Group project template for either Visual C# or Visual Basic, and choose Next. Provide the name for the Azure resource group you want to use and other project information. When you're done, choose Create. From the template list, select the Logic App template. After Visual Studio creates your project, Solution Explorer opens and shows your solution. In your solution, the LogicApp.json file not only stores the definition for your logic app but is also an Azure Resource Manager template that you can set up for deployment. 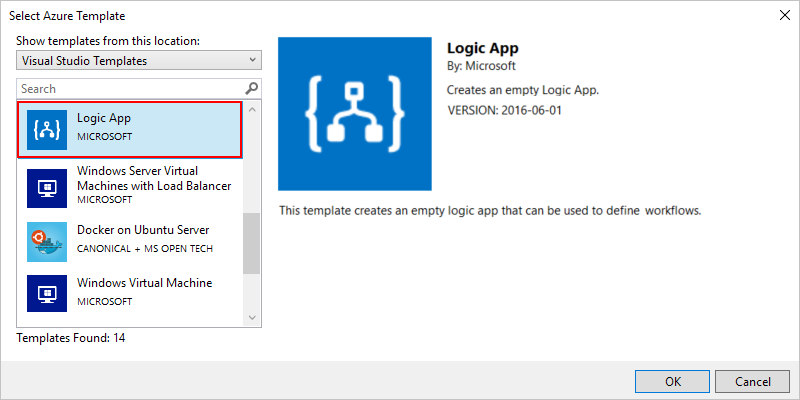 After you create your Azure Resource Group project, create and build your logic app starting from the Blank Logic App template. For Subscription, select the Azure subscription that you to use. 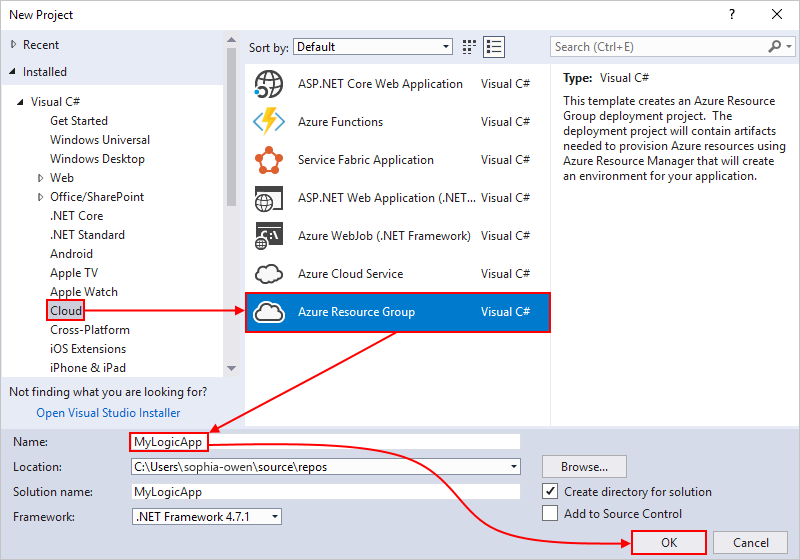 For Resource Group, select Create New..., which creates a new Azure resource group. Visual Studio needs your Azure subscription and a resource group for creating and deploying resources associated with your logic app and connections. The Logic Apps Designer opens and shows a page with an introduction video and commonly used triggers. Scroll past the video and triggers. Under Templates, select Blank Logic App. Next, add a trigger that fires when a new RSS feed item appears. Every logic app must start with a trigger, which fires when specific criteria is met. Each time the trigger fires, the Logic Apps engine creates a logic app instance that runs your workflow. 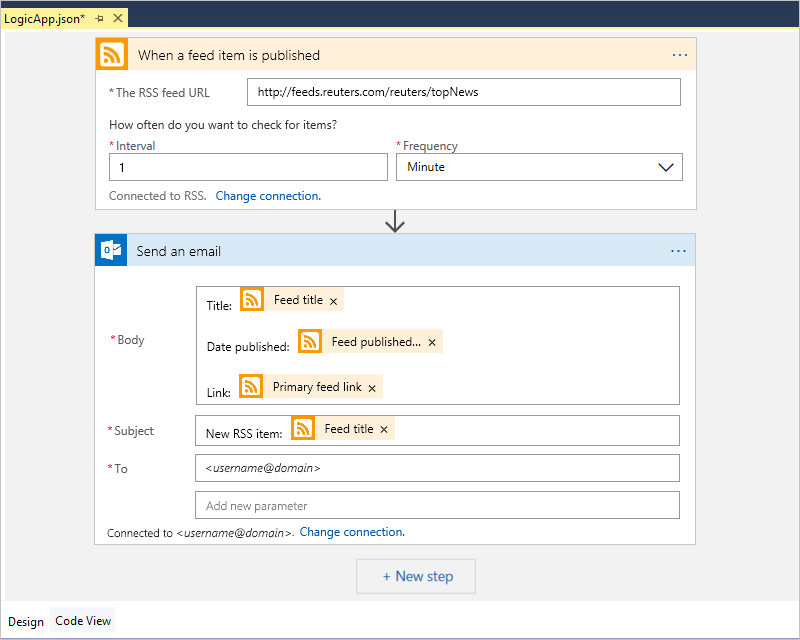 To finish building the logic app, follow the workflow steps in the Azure portal quickstart, then return to this article. Now, before you can test your logic app, deploy your app to Azure. 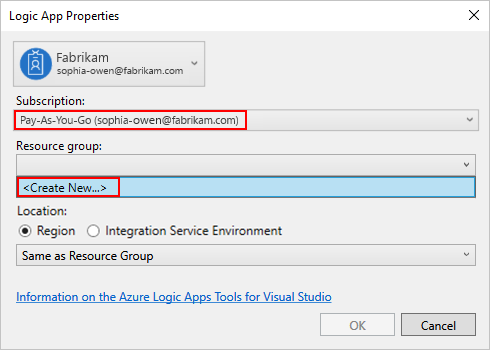 Before you can run your logic app, deploy the app from Visual Studio to Azure, which just takes a few steps. In Solution Explorer, on your project's shortcut menu, select Deploy > New. If prompted, sign in with your Azure account. For this deployment, keep the Azure subscription, resource group, and other default settings. When you're ready, choose Deploy. When deployment starts, your app's deployment status appears in the Visual Studio Output window. If the status doesn't appear, open the Show output from list, and select your Azure resource group. If the connectors you selected need any input from you, a PowerShell window might open in the background and prompt for necessary passwords or secret keys. After you enter this information, deployment continues. After deployment finishes, your logic app is live in the Azure portal and checks the RSS feed based on your specified schedule (every minute). If the RSS feed has new items, your logic app sends an email for each new item. Otherwise, your logic app waits until the next interval before checking again. For example, here are sample emails that this logic app sends. If you don't get any emails, check your junk email folder. Technically, when the trigger checks the RSS feed and finds new items, the trigger fires, and the Logic Apps engine creates an instance of your logic app workflow that runs the actions in the workflow. If the trigger doesn't find new items, the trigger doesn't fire and "skips" instantiating the workflow. Congratulations, you've now successfully built and deployed your logic app with Visual Studio! To manage your logic app and review its run history, see Manage logic apps with Visual Studio. When no longer needed, delete the resource group that contains your logic app and related resources. Sign in to the Azure portal with the same account used to create your logic app. On the main Azure menu, select Resource groups. 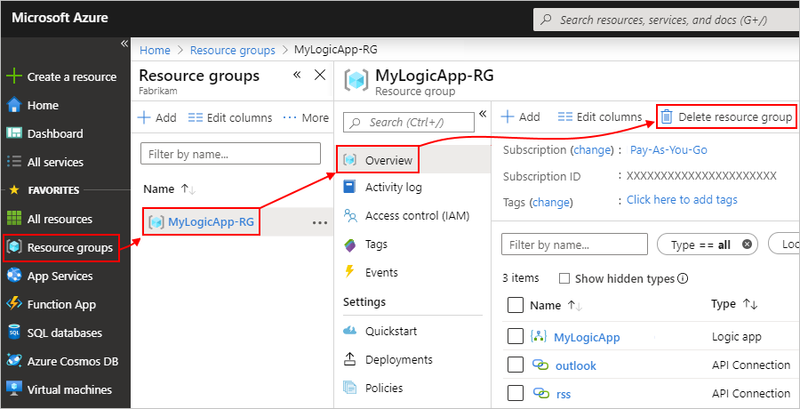 Select the resource group for your logic app, and then select Overview. On the Overview page, choose Delete resource group. Enter the resource group name as confirmation, and choose Delete. Delete the Visual Studio solution from your local computer.